Dating back hundreds of years, the origin of Thai Boxing or its real name, Muay Thai, referred to as “The Art of Eight Limbs”, was essentially, developed as a close-combat fighting style which was the primary method of self defense, that incorporates the use of all 8 “weapons” of the human body: the fists, knees, elbows and feet. Muay Thai, in the past 20 years, has swept across the world not only as a professional form but also as part of many fitness programmes. The increasing popularity of MMA has been one of the driving factors in Muay Thai’s new popular appeal as well as popular films such as Kickboxer starring Jean-Claude Van Damme. Muay Thai Fact: In its original form Muay Thai involved nine weapons, as well as the fists, knees, elbows, and feet, there was also the head. All Muay Thai fights will start with what is known as the “Wai Kru” and “Ram Muay” and is a very important and essential part of the sport of Muay Thai. The Wai Kru is a ritual performed by fighters before each fight in which fighters will circle the ring three times and then bow down in the middle of the ring to ask protection for himself and the other fighter, and for an honorable fight. 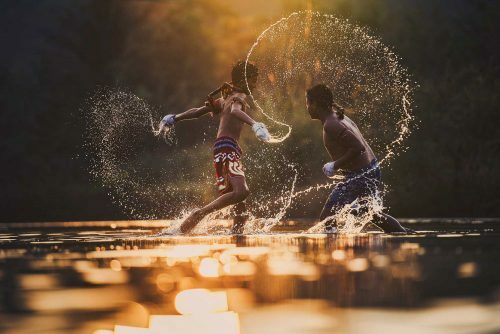 The fighters will then perform the Ram Muay, which is more of a personal ritual, in which each fighter will perform to demonstrate his or her prowess to the audience and of course their upcoming opponent. Another essential part of Muay Thai fights is the music, with drums, flutes and cymbals all add to the excitement, drama and spectacle of the fights. Before gloves and rings came into the sport, Muay Thai fighters would wrap their hands in cotton or rope. The fights would take place on the ground, with no padding and just a rope laid on the ground in a circle to indicate the boundaries. Muay Thai fighters are highly trained athletes and the process of training has not really changed over the past years, although the equipment has changed from leg kicking a banana tree trunk, to a heavy bag, although there are some Muay Thai gyms that will still use old training methods such as this. Muay Thai Fact: Leg kicks are considered the most effective weapon of Muay Thai. Not only do they offer the greatest distance in sticking your opponent, when mastered they are arguably the most effective kick in the martial art world. Fighters will train every day 6 days a week. They will start at 6 am with a morning run, around 4-8km. Back in the gym its time for the morning session which mainly consists of cardio and shadow boxing. Then its breakfast and rest before the late morning session, which would consist jump rope, more shadow boxing, pad work with the trainer, heavy bag work, 5 – 10 rounds of sparring and then abdominal work. Most fighters will then get to rest for the afternoon, until its time for the evening session which would follow the same pattern as the late morning session, but adding in some clinch sparring to replace the normal sparring. Then it’s off to bed to sleep before you get up and start it all over again. The training is brutal. This, of course, is a training schedule for a fighter, but you can see why Muay Thai has become so popular with fitness fanatics. There are numerous tourist style training gyms all over Thailand that offer tourists and locals a chance to train in Muay Thai as part of their fitness goals. The sessions are normal just a morning and afternoon group session but follow closely what a normal fighter would do. Muay Thai Fact: 15 is the age that you qualify to have a professional fight in Thailand. However, most 15-year-olds would have had many armature fights before they start professionally. Muay Thai has lost none of its attractiveness in Thailand and during televised fight broadcasts you will see people huddled around TV screens to watch, and the fights on TV rate among the Kingdom’s most popular programmes. There are gyms all over Thailand, some still using the old teaching methods and some more modern gyms. It’s a fantastic sport, yes its brutal to fight and in some cases train, but the health benefits speak for themselves, and the culture and traditions are still going strong some 700 years later.